The Glyn Vaults, Pensarn, Abergele. My family owned the Pensarn fish and chip known as ‘ The Glynne Cafe’ from before World War II until the 1960’s.The Glynne was the name on an old brass name plate on the front door. It is possible that the Old Glyn Vaults you mention are one and the same. Thanks for your input above Carol. I’ve had a look through both John R. Ellis and Ellis Wynne Williams books on Abergele/Pensarn in the hopes of gleaning some indication of the location of the Glynne Vaults, perhaps in relation to neighbouring properties or businesses, but without success. Nor could I find the property on the old maps I have for Pensarn although the Railway & Cambrian public houses were shown. Undaunted, I came across an entry in Slater’s 1880 Directory of North & South Wales which has an entry under Inns & Public Houses for a John Carrington, Glynne House, Pensarn. The 1881 Census shows a John & Mary Anne Carrington & family, resident at 5 South Parade, Pensarn with John listed as a retired Mariner. There is no mention of him being a retailer of beer or anything similar, however, so I think that is just coincidence. I next tried looking up the publican of the Railway Inn (Theophilus Pritchard, 1 Railway Terrace, Pensarn) on the 1881 census planning on browsing adjacent pages in the hopes of locating the Glynne Vaults. Due to changes to the sites I’ve used in the past, that wasn’t to be either, though I dare say it would be possible through a local library. Alternatively, perhaps one of the readers of this page will be able to succeed where I’ve failed. Whether Glynne House and Glynne Vaults were one and the same place, however, is open to conjecture I’m afraid. Could you please help me to locate Eurog House, occupied by my ancestors, the Roberts family, in the 1800s. Owen Roberts, a joiner, lived with his wife, Mary, at 79 Pleasant Place in 1871 and at 1 Clarence Place in 1881. Owen’s wife, Mary Roberts, (nee Williams) was formerly a licenced victualler at, I suspect, The Kings Head in Abergele, sometime between 1846 and 1881. I have the deeds and abstract of title of the above cottage going back to 1873 with much history of the families living there. In 1873 the property was left in trust to six children belonging to Isaiah Williams. One son Hugh died leaving a widow Mary Williams. Could she have later married Owen Roberts? The whole of the family history is documented and may be of interest to you. The house was known as Bryn Gele up until 1985. Hello Norman, thank you for your input regarding the above. You’ve obviously had a look through some of the Census returns, at least for 1871 and 1881, from your comments above. The 1872 map I have, though large-ish, doesn’t show individual house names or numbers I’m afraid, nor even every street. 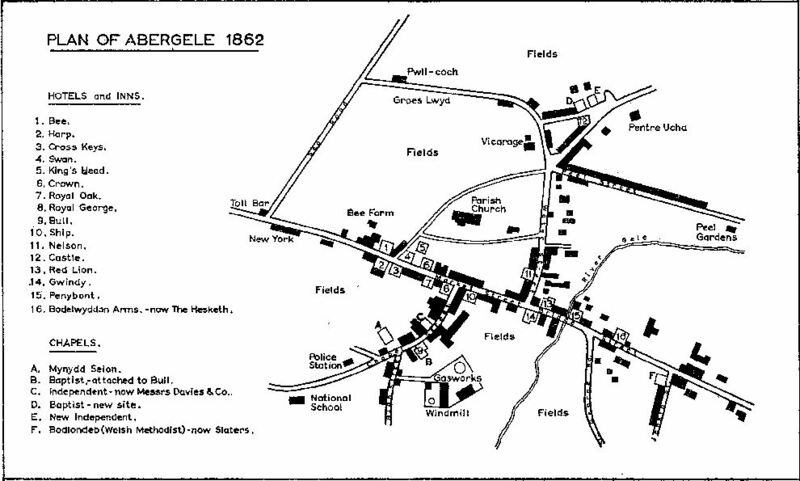 As you might have gathered from some of the exchanges above, my main reference sources are the two books by John R Ellis and Elllis Wynne Williams respectively regarding Abergele and district. Can you tell me how you came across the name Eurog House in connection with your family? Was it through a Census return and, if so, which year? Is that the whole of the address you have for Owen & Mary Roberts as well? Let’s hope we can narrow your search somewhat, even if only to an area of the town. Thanks for your reply, Nigel. My information was taken from two death certificates which I have copies of. Mary Roberts died on the 22nd. Jan.1901, and her husband Owen Roberts died 12 days later on the 3rd. Feb.1901, both at Eurog House, New York Terrace, Abergele. The cottages of New York Terrace are numbered 1 to 10, as far as I can see on Google street view, but I can’t find any reference to Eurog House. Hello again Norman, thanks for the additional information in your latest note. As I had to pass New York Terrace earlier today, I thought I would have a closer look in the hopes of unearthing something that perhaps wouldn’t have shown up on Street View. Sadly, that wasn’t the case. Very few of the terrace properties have a name or number; certainly none shown as Eurog House. I then decided to see if the library could assist but the old town records are now held in the Archives at Lloyd Street, Llandudno (Telephone or fax the service on 01492 577550 or e-mail to archifau.archives@conwy.gov.uk). I’ve a copy of an old postcard showing the top of Sea Road as well as the Terrace. I’ll post that as a separate item, along with a copy of that area on the 1872 map. It is quite interesting to compare the two, even if it doesn’t answer your question. I wonder if looking through the old Rates books might help. Some are available online but Llandudno Archives would probably be your best bet. The property would, I imagine, be put into context alongside the others in the terrace. Thanks, Nigel, for your old postcard and your 1872 map of New York Terrace, which are both very interesting. House numbers 1 to 7 can be identified, then what appears to be an alley (now hidden behind an un-numbered door), and then house numbers 8 to 10. Adjacent to the east end of number 10 is a larger, double-fronted house whose number is not clear. On the 1872 map, there are also shown three more properties behind the terrace, as well as a very large one even further back. I will contact the archives in Llandudno as you suggest to see if I can discover some more detail. Next to The Harp there were two houses – and then The Bee Gardens stretched all the way to the National Schools. In 1861, on the site of the present school (the present day Community Centre – my comments), there were old cowsheds called Pendre Bach. Park House and Park Villas (the properties you refer to Norman) were not there then. New York was in existence in 1861. EWW then goes on to describe the properties in Sea Road commencing with Roche Cottage (demolished in the mid-1960’s). Park House then is the property with the low, red brick wall around it and if one walks along the Public Footpath which runs due south between Park House (PH) and the Abergele Grill cafe you pass a couple of small buildings behind PH before coming to Park Villas (PV) about 100 paces further back. As they (PH & PV) seem to have been called that since they were built, that then would seem to point to Eurog House being one of the terraced properties, especially if the other buildings weren’t built until some years later. Don’t know if that’s any further assistance Norman. Hi Nigel, you’ve certainly been patiently unearthing a lot of detail about the properties around New York Terrace. I’m now beginning to suspect though, that the Roberts family may have just arbitrarily named their NYT cottage as ‘Eurog House’, and that this name just came and went with the plaque on the wall! Just out of interest, one of their sons, Hugh [my late Father’s Uncle] is said to have built the Lych Gate of St. Michael’s Church at the NE end of Church St. in 1887 for Queen Victoria’s Golden Jubilee – could there be a ‘Golden’ [Eurog] association there? Owen and Mary Roberts lived at No. 3 New York Terrace. They are in he 1891 Census and in 1901 the property was vacant following their deaths shortly before that census was taken. In 1891 Owen Roberts was a 65 year old joiner (born Holyhead) and Mary E. Roberts was 69 (born Abergele). On a wider note, most of the houses, whilst numbered, also had names, but they were mostly temporary and not official. For example, around the time of the Great War number 2 was Yorkford, 4 was Parkfield, 7 was Toll Bar Cottage. By 1911, number 3, the former Eurog, was York Cottage. Well, I think that Andrew’s reply above is the definitive answer we were looking for. Many thanks for that Andrew. All your years of research carried out in connection with locals and the Great War has obviously given you a far greater insight into the town and its inhabitants than I’d been able to come up with for Norman. So, again, thanks for that, as well as for the fascinating (and moving) series of articles you did on the Great War recently. There is, perhaps, a tendency to think that just because our War Memorial doesn’t contain hundreds of names then the town wasn’t affected that much. Often the survivors and their families paid an equally high price for their involvement, due to injuries both seen and unseen. Thanks Nigel, but no great insight in this case, just an observation in the 1891 census really! Thank you also for posting that wonderful picture of the terrace which I haven’t seen before. Any idea of the date? Your comment about the impact of the war on the families and the wider community is quite correct, and as the series develops many of the men will have much more detailed stories than has been the case thus far. The regulars and reservists, who have been centre-stage in the early months are quite difficult to develop as most had spent a significant proportion of the decade or so before 1914 in the army and away from Abergele. The next post in a week or so regarding Frederick Edwards of St. George is a case in point and is sadly quite brief. However the story of David Davies, due on 28 December, will carry some very moving and tragic details not only in relation to David, but also his brother and his son. Really fantastic example of what Abergele-based archaeologist Ken Brassil calls: crowdsourced history. It’s easy to see how Evrog might be mistranscribed ‘Eurog’. I have most of the family history of the Roberts family as 3 New York Terrace has been in our family since 1986 and we have the deeds going back to 1873 if you would like to contact me. Many thanks to Nigel, Gareth, Andrew and Albert for their very interesting and perceptive comments. I’m amazed at their detailed knowledge of the history of Abergele. I find this ‘crowdsourced’ explanation very convincing, that number 3, NYT was named Efrog House, transcribed as Evrog House, mis-transcribed as Eurog House and subsequently anglicised to York House. I have now shifted my research somewhat to the 3 initials over the Lych Gate of St. Michael’s church. They apparently say ‘HTR’, representing the initials of Hugh Roberts, the 4th. son of Owen and Mary Roberts, born in 1860, who is said to have built the structure. My late Uncle, Albert Williams, [grandson of Mary Roberts], in his book, ‘The Thomas-Williams-Roberts family’, refers to Hugh as ‘Hugh John Roberts’, which is slightly at odds with ‘HTR’, although a letter ‘T’ is easily mistaken for a letter ‘J’ in the records. Any comments on the above eagerly awaited! p.s. Is Albert Roberts a descendant of Owen & Mary Roberts? Just noticed your note asking if Albert Roberts is a descendant of Owen & Mary Roberts. Not as far as I am aware, my descendants were from Gwytherin and Pandy Tudur, but as you know once you catch the “family tree bug” – there is no cure! I think that Albert may have struck gold (no pun intended) with his comment above which Gareth has posted regarding the Eurog/Evrog/Efrog aspect. Add that to Andrew’s feedback and it looks like the query is solved. Regarding the date of the postcard for NYT on the page of that name Andrew, unfortunately I don’t know a specific date but feel it would be around the 1920’s, purely from comparing the style of it to similar ones of that era. Norman, I was having a brief look on the ‘net this morning for details of the Porch & Gate to St. Michael’s church, but only found a couple of snippets. I’ll have a read of my local history books over the next few days to see what else I can find. My better half & I need to call in at a shop near to Church Street in the next few days so I’ll have a closer look at the gate etc to see what else I can see. Watch this space. Nigel. I like the reasoning of how Efrog may have evolved into York Cottage. If it’s not right, it deserves to be! Hi Nigel, I think I’ve just solved the HTR initials mystery – if you look for Hugh Roberts on the 1871 census form, when the Roberts family lived at Pleasant Place, you can see that their 11 year-old son is listed as Hugh T. Roberts. His middle initial is the kind of stylised capital ‘T’ that we were taught to use at junior school (for real, joined-up writing), and it might easily be mistaken for a capital ‘J’ nowadays. Conversely, a capital ‘J’ used to start off with a big scroll-like loop, whereas a capital ‘T’ used to start off like a number ‘7’. So, this is more evidence that the 27 year-old Hugh T. Roberts did in fact build St. Michael’s Lych Gate in 1887, and carved his initials along the top of the front cross-beam. I don’t know if you were aware that the porch was built at the same time or whether your late uncle, Albert Williams, makes any mention as to any involvement or otherwise by HTR in the construction of that as well. I did manage to take a couple of fairly clear photographs yesterday, showing the initials and general inscription. If you would like copies, let me know and I’ll send them to you. Hi Nigel, and thanks again for your research. No, as far as I know, my late Uncle Bert didn’t mention the porch but I’ll keep it in mind. Yes please, I would like copies of the photos that you have taken – maybe you could save them as .jpg files, attach them to an email and send them to:- sawnow@tesco.net. In that way, I could send you, by return email, a few of my Uncle Bert’s photos which he has kindly passed on to me. Hello Joanne and thanks for your enquiry. I’m not sure how much help we can offer as you would probably be better served by approaching a genealogical forum or similar, but here goes anyway. You mention that your great grandfather lived at Penybont House in Abergele, as distinct from the public house of that name (recently renamed The Coach House). An internet search for Penybont House comes up with a variety of local businesses which run west to east along Bridge Street, starting at The Coach House and ending just prior to what was another pubic house, The Hesketh. It would appear, then, that he probably lived in accommodation above one of those shops. If you don’t know the area, have a look on Google Street View to see what I mean. You will need to have a look through what information you already have on him and his family, in the hopes of narrowing your search further. If you haven’t started a family tree yet, now might be a good time to begin. To find out how, look up ‘starting a family tree’ and have a read through some of the resultant guidelines – the BBC do one which is as good as any. There is free software on the ‘net if you decide to do it seriously or you could just use a big sheet of paper, perhaps the back of a piece of wallpaper, to note down their names, dates, relationships etc on. Once you have some definitive details for his birth, marriage (if applicable) and death you can expand your searches. Out of curiosity I searched for a William Henry Jones of Abergele, adding things like ‘football’ or ‘died around 1949’ but without success. Interestingly though, there is an entry on the town’s War Memorial for a Private 51968 George Frederick Jones who died in October 1916. He is shown as a son of William Henry & Martha Jones of Penybont, Abergele. Could he/they be related in some way to your family or, in view of the same name, could it even be your Great grandfather? That’s where a family tree would be useful to you. Searching against his name and address, I also came across a document on-line which someone is selling. It is a deed (conveyance) dated 18 June 1926 between a Martha Jones of Penybont House, Abergele. She is shown as the wife of William Henry Jones, a Builder & Contractor !! You mention above that he was a builder so, perhaps that is the same person. I don’t know if any of that is of assistance to you Joanne. If nothing else, it might point you in a couple of different areas for you to broaden your enquiries. Good luck. William Henry Jones was born in St. Asaph c. 1870. He was married to Martha c. 1895. He moved to Abergele from Rhyl at some point in the very late 1890’s, and after 1896. They lived at Penybont House, which is adjacent to the pub Nigel refers to above, and is now a shop. William was a Master Plumber. He had three sons. The eldest, William Lothian Jones was conscripted into the Royal Flying Corps in 1917 following a failed appeal to a tribunal. The second, George Frederick Jones (Fred or Freddie to everyone who knew him), was in the 17th King’s (Liverpool) and was killed in action 12/10/1916 during the Battle of the Transloy Ridges, part of the wider Battle of the Somme. The youngest, Harold Edgar Jones, was born c.1908 a good ten years later than his siblings. I’m afraid I have absolutely no idea where the football thing comes into it! A write-up for George will be part of my ongoing commemorations, but as it it will be nearly two yeas before the centenary of his death I append it below in case it is of interest. I’m Americian-born with a strong Abergele connection, my Father moved from there in 1968 to the US. I’m hoping to find out more information about my Taid Albert Roberts, died perhaps 1960? My father refers to his Roberts grandparents are Nian and Taid Pensarn….Might these folks be related to Roberts’ that are the topic above? His mother’s maiden name was Wynne-Jones, and he called her parents Nian and Taid Cadau, short for the name of the family farm south of Abergele called Cadau Mawr. I’m curious to know if my Nian (Jane Roberts, nee Wynne-Jones, died Nov. 1993) might have been related to Edward Irwine Wynne-Jones, of the Royal Welsh Fusiliers during WWI, and if so how. Any help would be tremendously helpful, it’s been twenty-five years since I’ve been back, and sadly I don’t think I’m going to be able to come check the records myself any time soon. Just noticed your note concerning your Taid – my namesake Albert Roberts. I remember an Albert Roberts being fatally electrocuted in the late 1950s – could he have been the person you are seeking? It seems very likely, though I was told that my father, Alun was around the age of fifteen when his father died, which would have been between 1959 and 1961. I could well be your American Cousin…. I have found the death of an Albert E Roberts, died in the June quarter of 1960, aged 53, registered in Aled district which covers Abergele Rural. Thank you so much for looking, if I ever get to come back for a visit, I owe you a drink of your choice, at the very least. I’ll have to confirm with my Dad if this is his father’s record, though I’m nearly certain it is. Just to clarify, you were named after an Albert Roberts who died from being electrocuted accidentally? No, no, I only remember the fact that when I was a teenager in Abergele, a man of the same name as me died by electrocution, he was not a relative – he just had the same name. I found the death details in the free birth, marriage and death records. Hi Sian, hope you got my last message. My dad was Alun’s cousin and my taid Albert’s brother. I remember your nain Jane well, she was quite small build like your dad always was. Have you any photos of them? I have one of Albert and Jane with your great nain and taid and all the family. Hoping to hear from you soon. Your dad’s cousins Judith and Jean still live near here. I don’t have many pictures, most of them are from my visits to Abergele over the years. My Dad has a few, which he’s supposed to be scanning. I’ve replied to you in that other thread about most of this…. Not sure what you mean by that other thread Sian. On the blogsite, there’s this: Pingback: American Abergelite seeks info about Albert Roberts – AbergelePost.comAbergelePost.com – It’s underscored like a link and carries you to the other thread I mentioned. It’s actually the place you responded to first, rather than this thread of inquiry. My ancestors were Roberts from Abergele. They left Wales sometime around 1900 and moved to Lancashire, then Yorkshire and finally to Durham where they found work in the coal mines. Inside a Welsh New Testament owned by my mother, there is a note with a comment that my great grandparents people ‘had’ the Harp Hotel and ran the Hesketh Arms in Abergele. Also, when my grandmother (nee Eliza Roberts (born 1900 in Wigan) visited Abergele in the 1960s, apparently she saw a photograph of her father with a horse in the Harp Hotel. Anyone know if such a picture still exists? Does anyone have any record of the Roberts family running the Harp or the Hesketh Arms? My great grandparents were William Roberts and Maria (pronounced ‘Mariah’ as in the police vans). Maria’s maiden name was Griffiths. In Ellis Wynne Williams book, page 92 he states that Gwalia House was in fact The Kings Head and not The Crown. May I have your comments ? Hi Dennis, can I ask you to bear with me for the time being. My wife is currently not enjoying the best of health & we’re having to travel to the hospital twice weekly. I will look into your enquiry though & get back to you asap. I trust that’s OK. & that you’re keeping well. Nigel. Hello again Dennis, with a little spare time on my hands this afternoon I had another read through my original article above together with a re-read of the page you mentioned in EWW’s book. I also had a look through my copy of J.R. Ellis book, apparently a source which EWW also looked to. I don’t know that I can give you a definitive answer, only describe how I arrived at my wording/conclusion. You are correct in what you say about Gwalia House being a tavern called The King’s Head in 1861. However, I wonder if that Gwalia House is actually the same building as the one we know by that name today. The copy sketch map ‘key’ which I included with the original article (above) shows three ‘Hotels & Inns’ in that area – numbered 4, 5 & 6 which are titled respectively as The Swan, The King’s Head & The Crown. The King’s Head is actually shown as set back, between The Swan & The Crown & doesn’t have any frontage at all onto Market Street. I seem to recall that, having written the draft version of the article, I then had a look at the backs of the buildings concerned – from roughly the area of the Parish Church Lytch Gate towards Market Street, as well as from the area behind where Dorothy’s Flower Shop is. There appeared (to my eyes anyway) as if there had once been a building to the rear of the modern day butchers shop & I also had a chat with the proprietors of Gwalia House who mentioned that, down the years there had been many alterations and improvements made to the place. My conclusion (erronious or otherwise) was that the The Kings Head aka the Gwalia House that EWW referred to on page 92 was, in fact, an older building once situated to the rear of the modern day properties but no longer extant. Adding to my ‘theory’ was EWW’s comment, in the lines above on page 92, that ‘The Crown Inn was a tavern & butchers shop, kept by Edward Roberts, …’ J R Ellis appears to give this some credence when (page 111) he says that ‘There were only two butchers’ shops in the town – one at The Crown Inn, and the other at The Crown Bach’. The Crown, according to the sketch map above & on page 76 of EWW’s book appears to correlate with the present day Gwalia House. It may well be that I am mistaken, and if so, I hold my hands up and say ‘mea culpa’. Ideally, reference to an old street plan showing the individual properties would be useful. Perhaps there are others, yourself included, who might have access to other documents which may shed more light on this. I’d certainly welcome any feedback. Does this go any way towards answering your query at all Dennis. A great piece of detective work there Nigel. The mists of time often shroud the facts, so well done for making this case. Wishing your wife a speedy recovery, Gareth, ed.